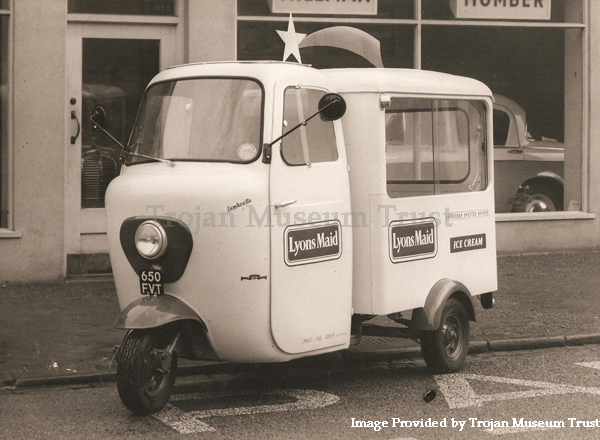 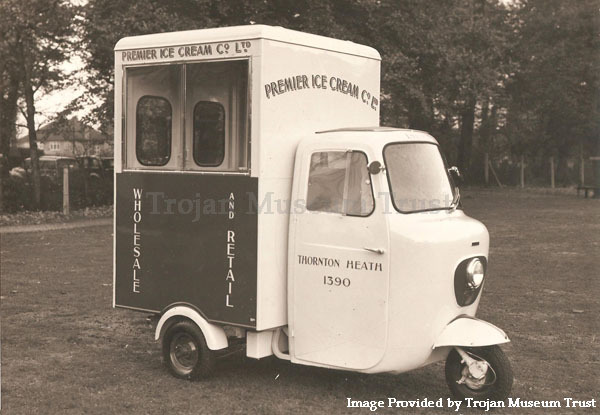 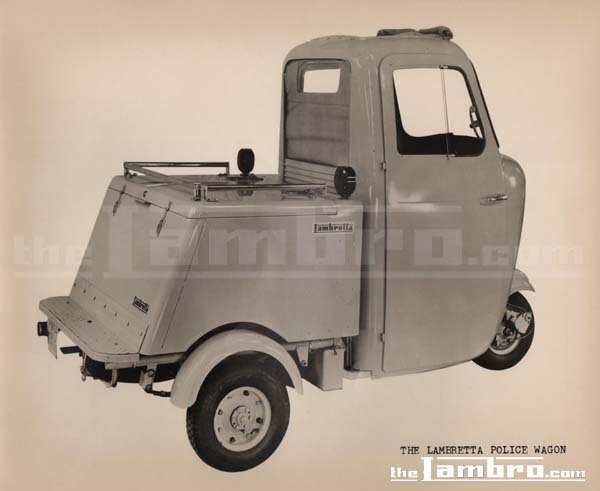 The FDC model was launched in 1957 and was the first of the Lambretta three-wheelers to feature a cab. 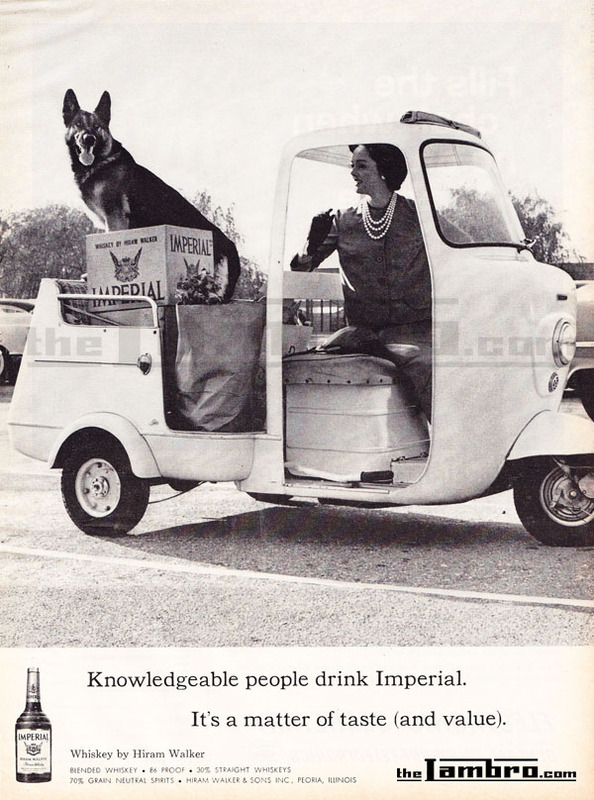 Advertised as 'ample' the cabin featured a roll-back canvas sun-shine roof. 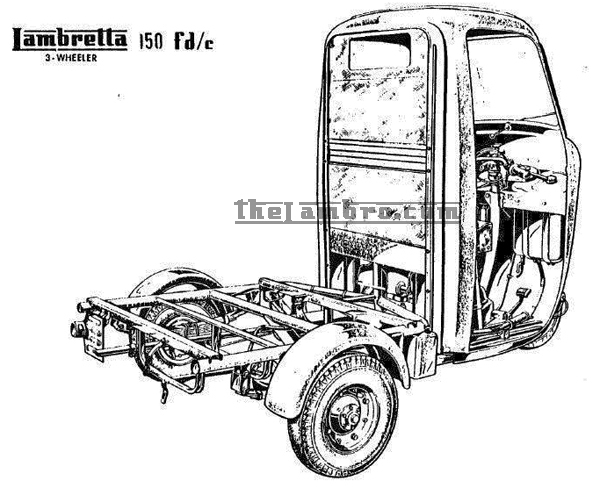 The seat was a bench seat which at the time of the FDC's release was advertised as for two people. 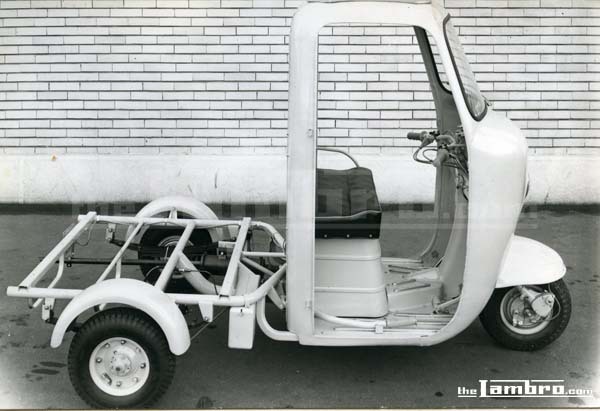 Features of the cabin included a large area windcreen to give all round visability, windscreen wiper, speedometer, anti-theft steering, steering head damper. 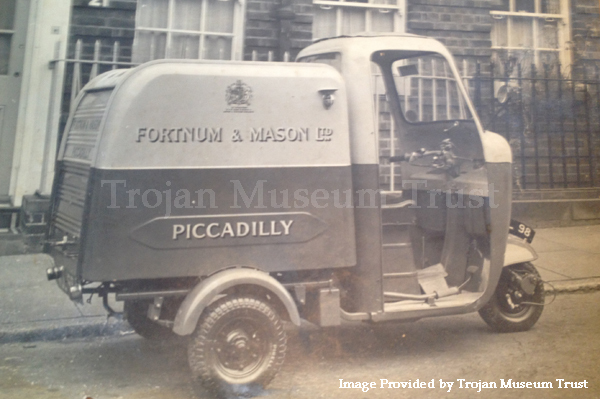 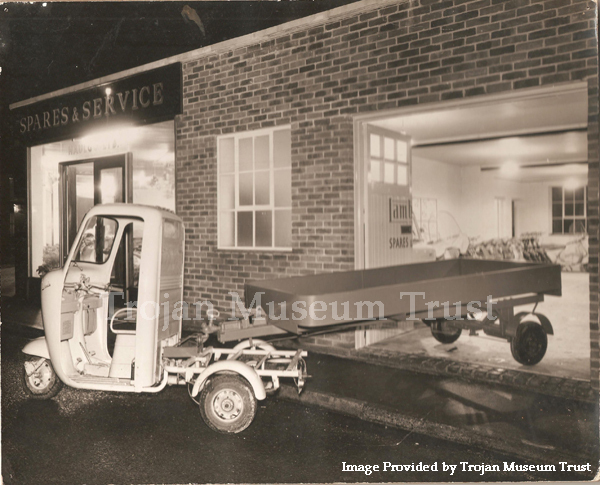 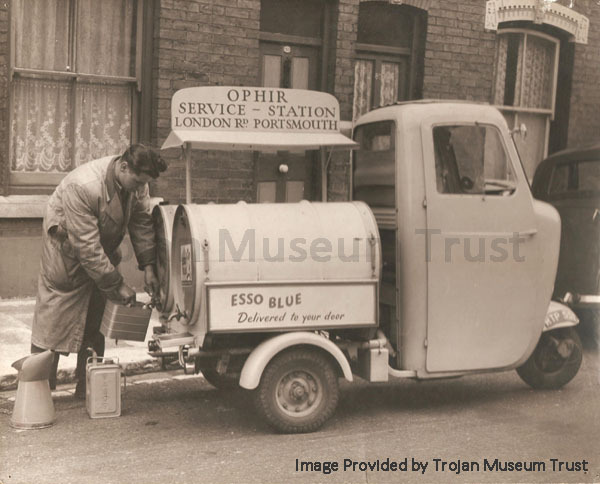 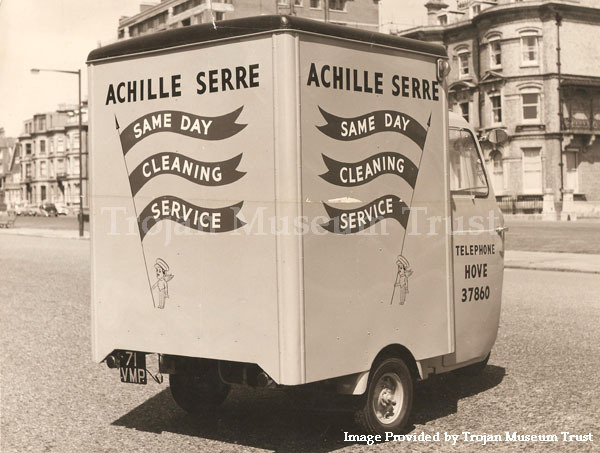 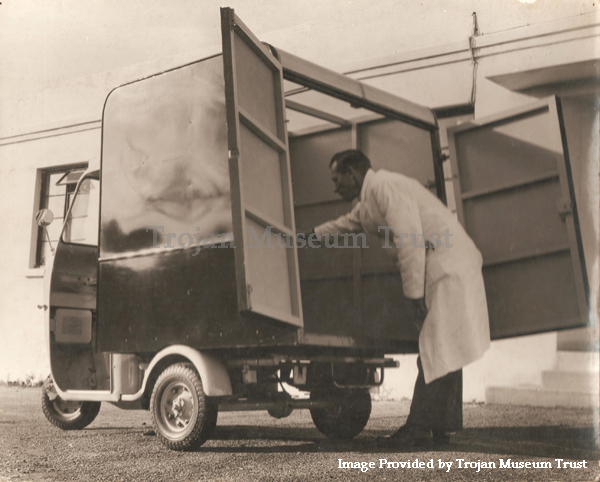 A tool box was mounted on the chassis behind the cab, to carry a jack and wheel spanner and a spare wheel was carried in a cradle at the rear. 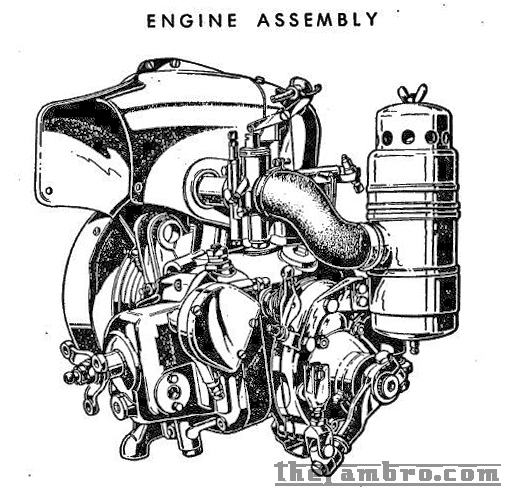 The engine for the FDC was a single cylinder two-stoke 150cc with the same power unit as the Lambretta scooter although transmission ratios were altered to accommodate the maximum output of the power unit. 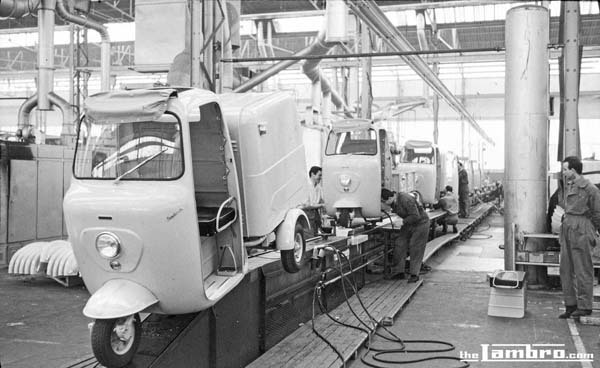 The engine was mounted vertically on three flexible supports to the main central beam. 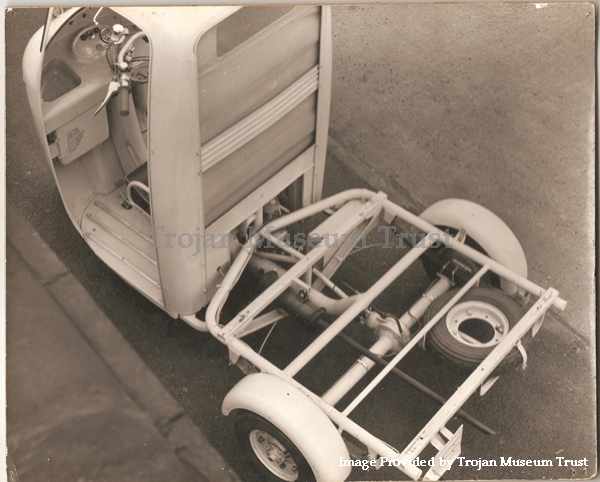 The chassis itself was created from high resistance steel tubing. 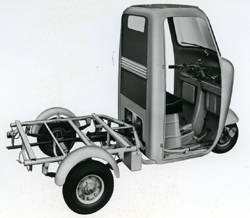 The cabin, body and seat structure were welded. 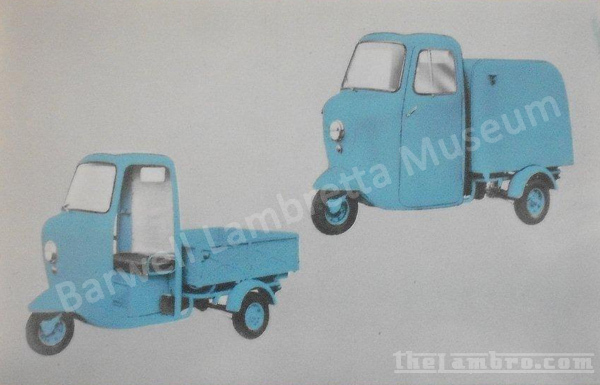 The FDC was the first of the Lambretta three-wheelers to come with a pedal controlled reverse gear. 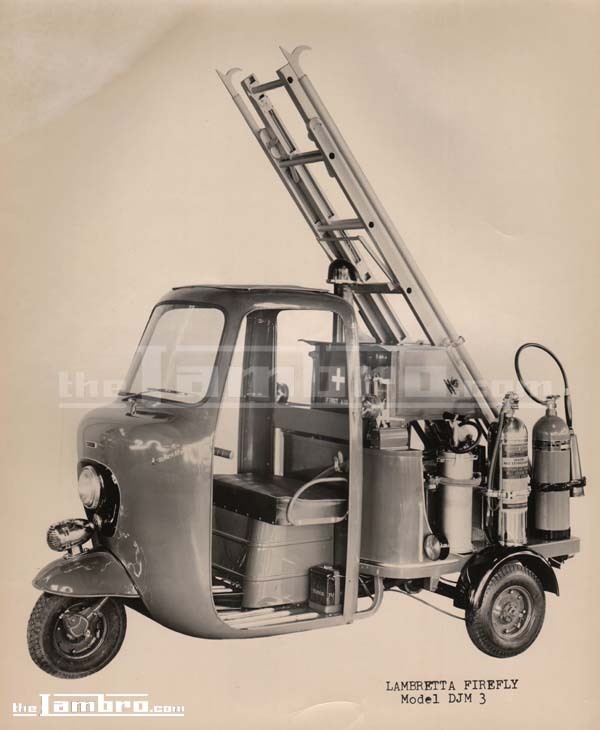 The transmission was provided by means of tubular propellor shaft with front splined sliding sleeve; front and rear Hardy Spicer couplings with a fully floating rear axle with splined half shafts and bevel geared differential in an oil bath. 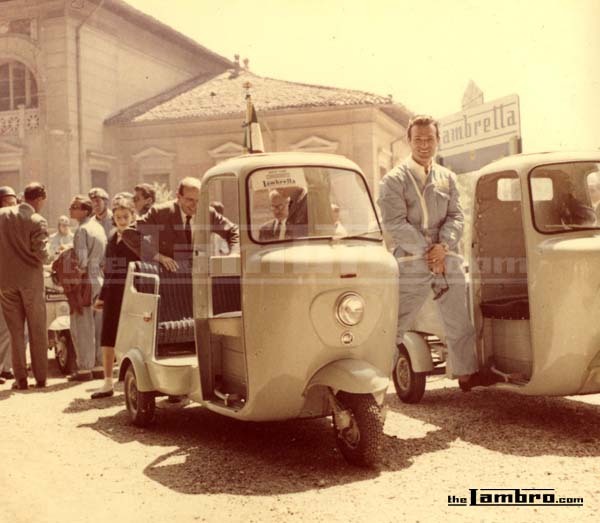 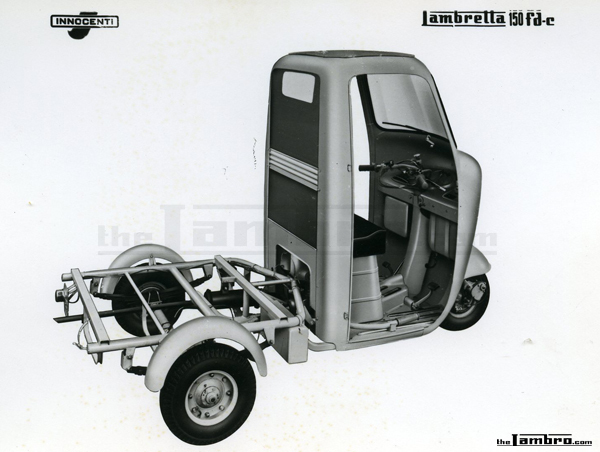 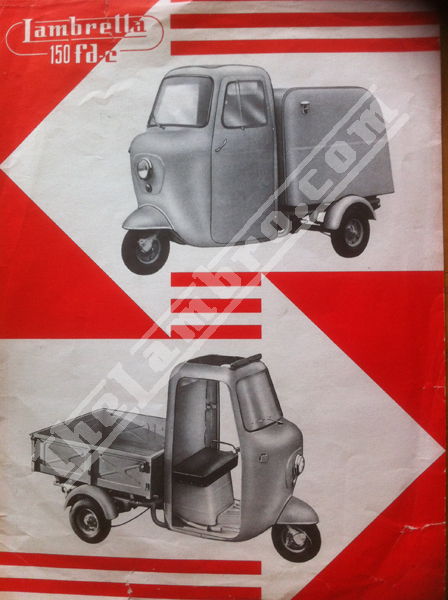 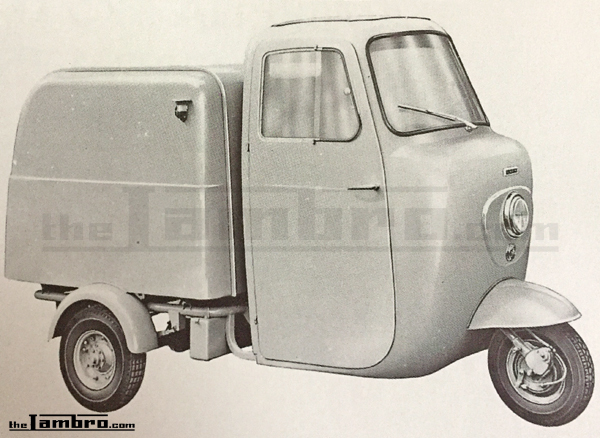 The Lambretta FDC 150 was also avaliable to buy as 'chassis' only enabling concessionaries, carrozzeria and individuals to design many variations for the FDC. 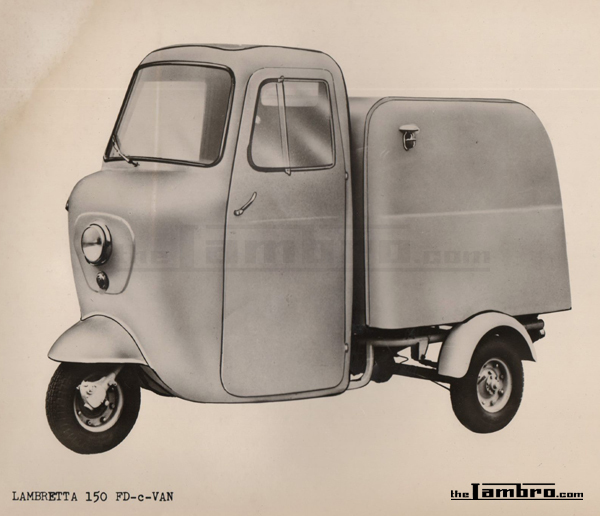 Capacity: 148cc Output: 6 H.P. 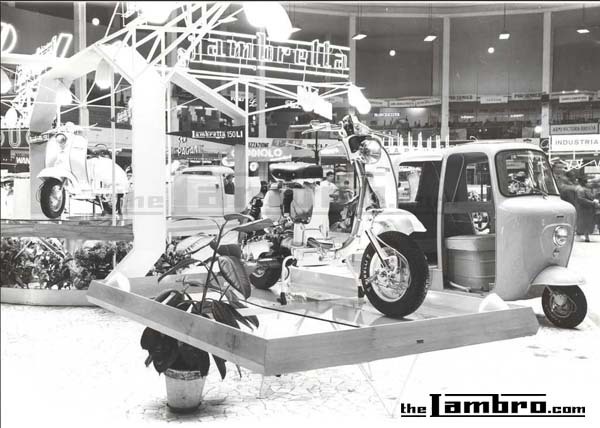 at 4600 R.P.M. 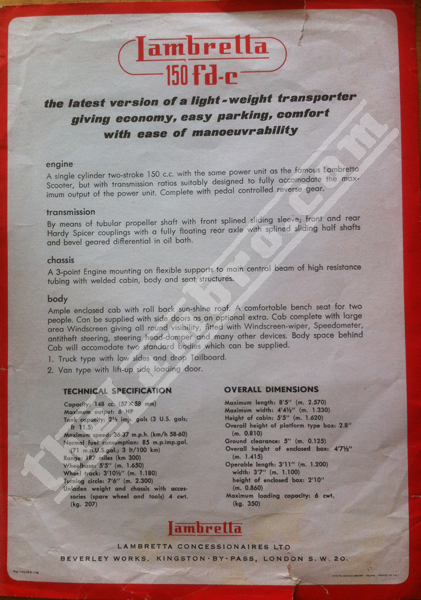 NOTE: Technical specifications have been taken directly from Innocenti documentation eg User Manuals for each model. 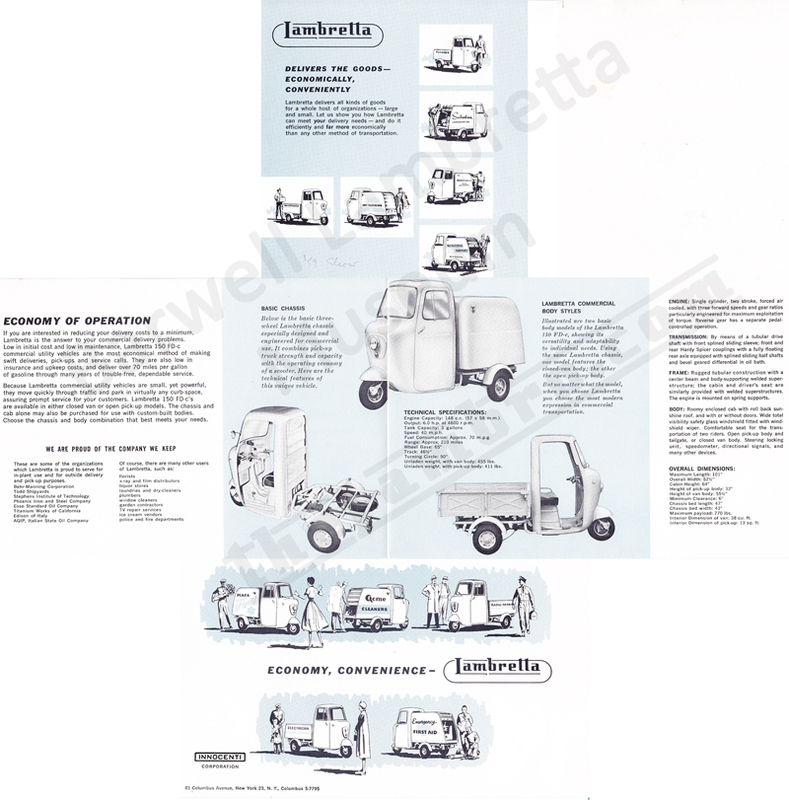 Later workshop manuals and amendments made after the publication of each manual may mean that these details appear differently in other documentation and may be different for your particular model.